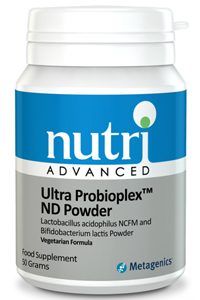 Nutri Advanced Ultra Probioplex ND contains the NCFM strain of Lactobacillus acidophilus, one of the most extensively tested and effective acidophilus strains available. 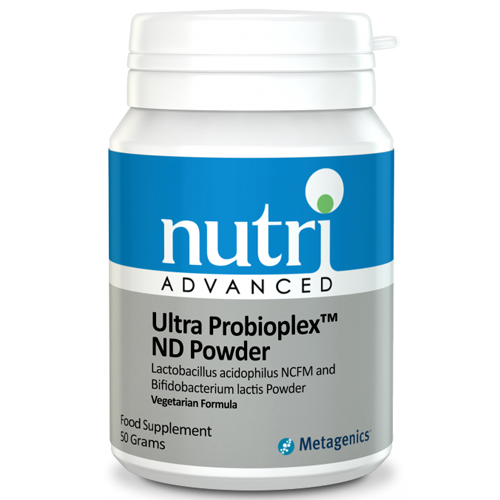 Ultra Probioplex ND also contains Bifidobacterium lactis Bi-07, one of the most abundant and perhaps most important types of bacteria in humans. In addition, Nutri Advanced Ultra Probioplex ND contains Vitamin D which contributes to the normal function of the immune system. Ultra Probioplex ND Provides a guaranteed 15 billion live organisms per ¼ teaspoon - an amount found to be clinically beneficial. Mix one-quarter of a teaspoon (0.75g) with un-chilled water one to two times daily, or as directed. f pregnant, breastfeeding, taking any kind of medication or have a medical condition, consult a healthcare practitioner before using this product.